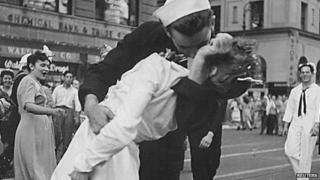 McDuffie's claim to be the man in the famed VJ day photo was supported by a police forensic artist's analysis. Photographer Alfred Eisenstaedt took the image as the news of Japan's surrender filtered through New York's Times Square on 14 August 1945. "I was so happy. I ran out in the street," said McDuffie, who was then 18 and on his way to visit his girlfriend. "And then I saw that nurse,'' he said. "She saw me hollering and with a big smile on my face... I just went right to her and kissed her." Edith Shain, who worked in a nearby hospital, claimed to be the nurse in the photo. She died in 2010.